JimB had the most liked content! Northern Shoveler ~ female.... I bought a new "wetland/marsh" patterned camo netting that allowed me to blend in pretty well with my surroundings at a local wetland here in Ohio. A number of waterfowl species came in quite close including: Northern Shoveler, Green-winged Teal, Pied-billed Grebe, Bufflehead, Ring-necked, Wood ducks and a muskrat! All giving me good photo ops. My previous post of the Green-winged Teal was taken at the same area. Bufflehead are fairly common this time of year in the Great Lakes region where they can be found on relatively small ponds to large lakes (not saltwater). You can have a frozen pond one day have it thaw the next and find Buffleheads on it the following day...which is a good thing! Another shot of a local Barred Owl. 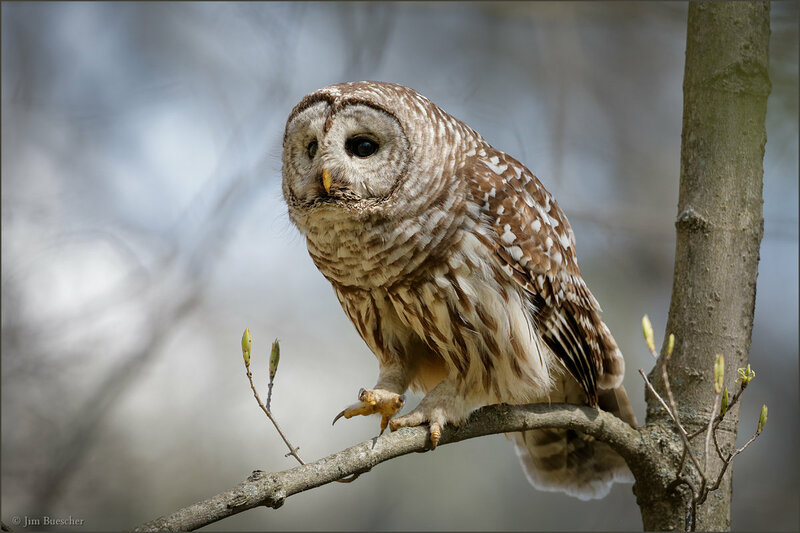 Barred Owl photographed in a local park. Awesome shot! Tough enough to get a decent shot of one let alone a super close-up with a perfectly posed fish. Super detail too! Hooded Merganser. I have a shot showing the profile but I thought I would share this more head-on look. You need to put up a sign..."Trespassers Will Be Shot"...with a camera of course!